EUROMIL organised a training session and roundtable discussion on the role of military associations and unions in the Balkan countries, with a particular focus on social dialogue, on 15 September 2015 in Skopje (FYROM). While the right to freedom of association and related rights are recognised for military personnel in international legislation, these rights are still restricted in a number of countries, which negatively affects the protection of military personnel, their moral and loyalty as well as progress towards democratic armed forces. 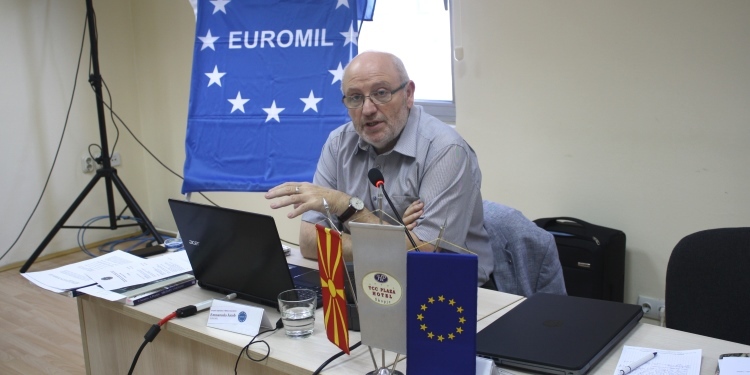 In this context, EUROMIL held a meeting in Skopje on the role of military associations and unions in the Balkan countries to foster dialogue between representatives of national political and military authorities and those of military associations and unions. The event facilitated the exchange of information on standards, experiences and best practices regarding the exercise of the right to freedom of association for military personnel in the region. Moreover, it focused on social dialogue and guidance was provided on how to create the conditions for effective cooperation at national level. There were 18 participants from Bosnia & Herzegovina, Croatia, Denmark, FYROM, Kosovo, Moldova, Montenegro, Serbia and Sweden, representing military associations, political and military authorities, civil society and academic organisations as well as the meeting organisers. Although servicemen and –women, as “Citizens in Uniform”, should enjoy the same fundamental rights and freedoms as any other citizen, participants noted the varying degrees of restrictions to the exercise of these rights and freedoms for military personnel in their respective countries. While in FYROM soldiers for instance enjoy full trade union rights, in Moldova soldiers are still prohibited from setting up and joining military associations due to the requirements of service. In other states such as Bosnia & Herzegovina, Croatia and Kosovo military personnel enjoy the right of association in their legislation but nothing has been arranged in practice. Finally, in Montenegro or Serbia, military personnel are granted trade union rights in their national legislation but those rights are still not fully implemented. The possibility of easing some restrictions will be considered in some of these countries. It was highlighted that any restriction on freedom of association should be prescribed by law, necessary, proportionate and non-discriminatory. The meeting did not only focus on the right of association but it was clearly acknowledged that without the right of association, soldiers cannot speak for themselves and raise their concerns. Participants agreed that the rights of military personnel should be respected and protected. Therefore the need to create an enabling environment for military associations or unions to function and for creating the conditions for the rights and freedoms of military personnel to be respected, both in legislation and in practice, was particularly highlighted. International standards such as the Recommendation CM/Rec (2010)4 of the Council of Europe on Human Rights of the Members of the Armed Forces, the OSCE Code of Conduct on Politico-Military Aspects of Security or the jurisprudence of the European Court of Human Rights on this matter were presented. The situation of military personnel in Denmark and Sweden served as examples of good case studies. It was nonetheless mentioned that although states should apply these basic rules, no unique model shall be followed. Each country should arrange its system depending on its own history, culture and institutions. On social dialogue, participants discussed the issues of membership and representativeness, as well as the questions of negotiation and collective agreements. The importance of establishing a well-regulated system of cooperation among the political and military leadership on one side and military associations on the other side was underscored. They should engage in a formalised, structured and participatory manner on issues concerning the conditions of service of members of the armed forces. In order to achieve this goal, three elements were identified as keys for success, namely mutual trust and respect, time – for changing not only laws but also mindsets – and members. EUROMIL will continue to support anyone who requests supports on these questions. Having chosen to focus its attention on the Balkan region in the period 2015-2016, EUROMIL decided that a training session “for associations in progress” in the Balkan countries will be held in the presence of national representatives. The meeting in Skopje followed meetings of a similar format EUROMIL co-organised with the OSCE Office for Democratic Institutions and Human Rights (ODIHR) for the southern European region in Madrid (Spain) in November 2013 and for the central and eastern European region in Budapest (Hungary) in September 2014. It involved associations and countries with which EUROMIL never had previous contacts. Follow-up actions and opportunities of further engagement with some of them are strongly encouraged.